Batman and the “Batman family” dominate DC Comics and Warner Brothers’ superhero movies to a very high degree. However, things are quite different when it comes to television. Although Batman still dominates DC’s animated programming, for some reason, it’s Superman that’s the go-to DC character for live-action TV shows. But why is this the case? Producing a Batman show would seem like it’d be (somewhat) cheaper, versus the special effects required for a Superman show. And Batman’s quite popular; there’s even plans to develop live-action TV shows about Batwoman and Alfred Pennyworth. Still, it’s the Superman family that seem to have dominated DC’s live-action TV efforts. Below, I offer a few guesses why that’s been the case. 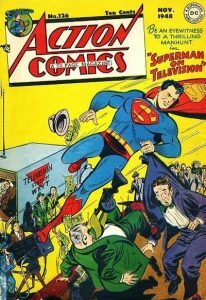 “Action Comics” #126 (November 1948). Art by Al Plastino. As of this writing, there’s plans for upcoming shows starring Batwoman and a young Alfred. There’s also plans for a “Metropolis” TV show starring a pre-Superman-debut Lois Lane and Lex Luthor. (Meanwhile, “Gotham” is on its final season.) While DC/WB’s clearly trying to expand Batman’s TV space, Superman still has a big presence. “Superboy” (vol. 1) #98 (July 1962). Art by Curt Swan. Another factor is the precedent of Superboy stories in the Superman mythos. 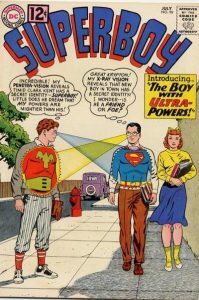 The idea of Superman having had adventures as a youth came along in 1945, with Superboy’s debut. Superboy stories were published over the next four decades, only ceasing with the John Byrne Superman reboot in 1986. However, stories about young Clark’s life continued to be occasionally published even after this point. A few later retcons/reboots reintroduced Clark’s Superboy career, though generally only operating in the Legion of Super-Heroes’ era. As such, a sizable amount of stories, characters, and other elements were available to adapt for shows like “The Adventures of Superboy” and “Smallville.” The latter was particularly successful, running for a decade as the longest-running live-action Superman-related TV show to date. Meanwhile, despite the prominence of Thomas and Martha Wayne’s deaths in the Batman mythos, Bruce’s life as a youth generally seems downplayed. Stories tend to be vague about Bruce’s life between his parents’ deaths and his debut/early career as Batman. Other than “intensive (Bat-)training and education” and a few flashbacks/storylines, there’s not as much precedence for the adventures of a teenage Bruce as an ongoing narrative. 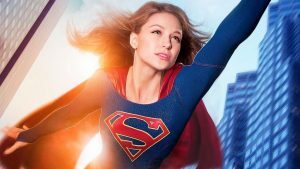 The current main Superman family TV show is “Supergirl,” which has thrived since its channel hop from CBS to the CW. The Girl of Steel’s show also has a large fandom among women, as well as an LGBTQ fanbase (thanks to several characters). For the most part, Clark Kent’s personality is that of a likeable, “mild-mannered” guy. Such qualities, combined with usually being a handsome fellow, might make Clark appealing as the star of a TV series. “Green Arrow” #15 (September 2002). Art by Matt Wagner. 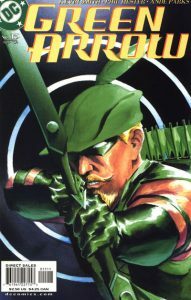 The TV show takes a more somber view of Green Arrow, versus the “outspoken liberal/George Carlin as a superhero” characterization Ollie had between the 70s and 2000s. Some might feel this makes him too much like Batman. However, that’d technically be faithful to how Green Arrow was originally conceived. From his 1941 debut through the late 60s, Green Arrow was a Batman imitation, albeit one of DC’s more popular ones. A sidekick? Car? Plane? Cave? Millionaire background? Oliver had all of those. So I suppose making Mr. Queen a brooding hero ultimately just goes “back to his roots”… as a Batman-like hero. Given the dominance of “Arrow” (it’s been renewed for an eighth season), there might be less need seen for another TV series starring a DCU-based brooding wealthy hero as the main star. Even if it’s their more popular brooding wealthy hero? The spectre (depending on one’s point of view) of the classic 1960s Adam West “Batman” TV series might still loom over the idea of creating a new live-action TV show actually starring a costumed Caped Crusader. Some suggest Warner Bros. doesn’t want the lucrative Batman movies “diluted” by a TV version. However, that hasn’t stopped multiple Batman animated TV series and direct-to-video films, the latter which can be as dark as their live-action counterparts (an adaption of “The Killing Joke?”). Overall, I suspect Superman’s more popular than Batman for live-action TV due to a mix of: a more charismatic lead character; Superman-related shows having a tendency toward being successful and long-running; a teenage version of Superman that’s easier to adapt; women making up a large part of the fandom and cast of Superman-related shows; and DC already has a wildly successful TV show starring one of their most popular Batman pastiches. So despite Warner’s fumbling at putting the Man of Steel on the big screen, at least the Superman family of characters still do well on the small screen.